Hi, I can offer you several boots and heels in EU-sizes 43/44. They are in very good conditions. Feel free to contact me for further informations. Thanks. I have also serveral pairs of their otk and crotch high chap boots. Hi @Biostim, yes, I will do it! 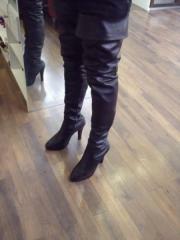 I want to wear otk boots with heels from 'Long Tall Sally' (LTS). Hello, I'm from Franconia, Nuremberg (Nürnberg). Looking To Set Up A Heel Meet In Toronto. Anyone Interested? Hello, not every woman want to see a man in heels. But there are may wowen like it when the men do it. Hello, I own a pair of Fernando Boots in size 47 (No. 112). I have bought it via Internet. The boots are very comfortable! Best regards PS: Take one size more than you wear normally!